Taxidi is one of those restaurants which offers up a little more than food. As a Greek taverna with timber framed windows and a stone façade, you would expect the interior to be either very modern or very traditional. It's neither. 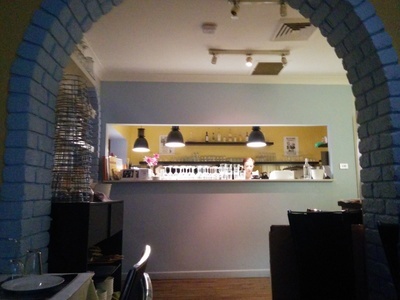 The bar is nicely framed by a blue arch - little features that make the restaurant seem smaller and more intimate. White walls, bright blue aspects and picturesque murals make no appearance here - they'd simply have no place among the huge patterned collages of black and white photographs and old movie posters from decades past. Just left of the main entry door, a mysterious timber staircase sweeps upstairs, while the rest of the restaurant opens up in front. A small dance floor, which doubles as a thoroughfare and space for the musicians, takes centre stage just in front of the door. The house band, a traditional Greek ensemble called Out of The Blue, is set up to the left, bouzoukia and other traditional instruments filling hands and hanging on the wall behind them. They're at the taverna every Friday and Saturday, and their set list of traditional music adds to the atmosphere. 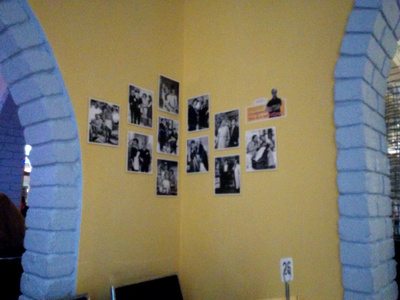 Black and white stills from Greek films cover walls and make for some very kitsch placemats. You get the sense Taxidi wasn't built as a restaurant, and if it was, it was built to hug the patrons in a cosy embrace and keep their secrets in shadowy corners with only the Greek film stars looking on from the walls to overhear. The dancefloor space however is larger and perfect for socialising. You can even having a go at some traditional Greek dancing - if you're so inclined. 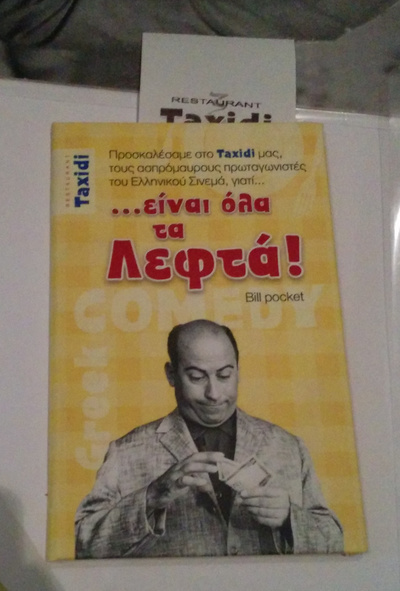 The novelty and delight of this place is all in the theme; the entire restaurant is an homage to old Greek movies - the comedies, the dramas, and the tragedies, as well as their big stars.The black and white photos adorning the walls are stills from old films. Two televisions, set high on the walls, play silent movies, and the placemats and even bill wallet all follow through with the theme. 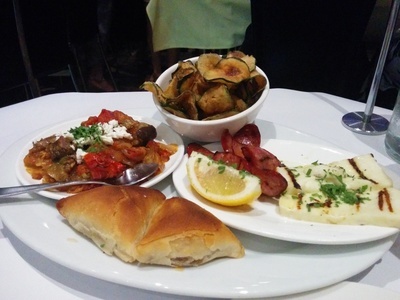 On Friday and Saturday nights, when the band, Out of the Blue, play their low key traditional music, the banquet meze menu ($50 per person, not including drinks) is the only option available. The first round of the set menu seems to start of well, with a very fresh theme. 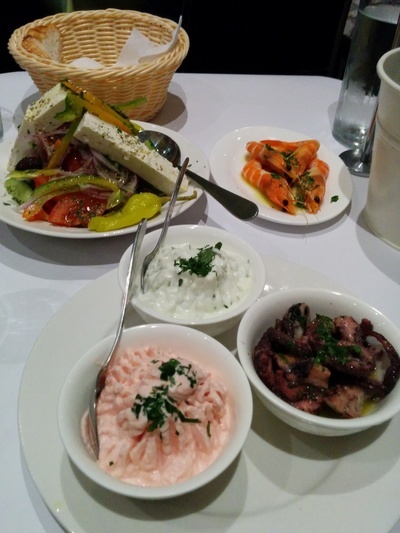 Our menu began with dips and salads - traditional taramosalata, tzatziki, marinated octopus and a Greek salad. The taramosalata was very good, a perfect, soft blend with balanced flavours. The tzatziki, a dip made from yoghurt, cucumber, garlic and olive oil, wasn't quite salty enough for me and didn't have enough garlic. The marinated octopus, a favourite of mine, is dressed in a tangy oil and lemon dressing with a bit of parsley and cooked to a perfect tenderness. The Greek salad - a classic featuring fresh vegetables, crisp capsicum, cucumber, onion, soft tomatoes and salty, creamy fetta, is dressed simply with oregano and a bit of olive oil. It's simple, traditional and yummy, with the excess olive oil perfect for bread dipping. My only complaint is a shortage of salt. The mostly peeled prawns are nothing to write home about and their dressing does little to enhance the flavour of the prawns. Nevertheless, the prawns themselves are fresh and cooked well. Baked and fried goodies come out now -zucchini chips were the highlight here. More of our meze arrives heaped on platters. The salty, crunchy zucchini chips which go down just as well on their own or with a blob of tzatziki are a nice surprise. The haloumi, accompanied by slices of tangy lemon is perfectly cooked and importantly, still soft when it hits the table. Next up, an olive pie makes an appearance. It is surprisingly good, made with crunchy fillo pastry and filled with a yummy olive and onion filling. The arrival of the imam bayildi puzzled me. It’s one of the more obscure Greek dishes and I honestly didn’t know what it was. A traditional dish of both Greece and Turkey, imam bayildi is traditionally stuffed eggplant. In Turkish it means “the priest fainted” (don’t ask me why, but if anyone knows, I’d be really interested). On some Greek islands, the dish is served like a stew of mostly eggplant in a thick and flavourful tomato sauce, as it is here. Personally, I’m not a huge fan of eggplant, but this was good and it was refreshing to try something really traditional which isn’t normally served on a set menu. Glistening meats finish off the meal. Last course of the meze meal is souvlakia, lamb cutlets and biftekia on a bed of chips. The chips are large, hand cut and mostly soft, but they could be better. The meats on the other hand are beautiful. 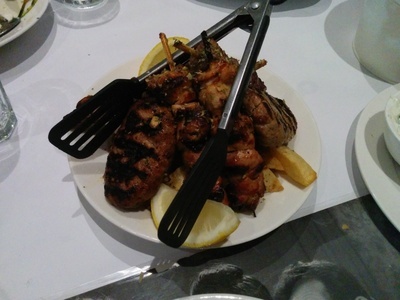 The souvlakia are tender and well-seasoned and the lamb is beautiful and juicy. The biftekia are also very nice - spiced with cumin and very moist. Thankfully dessert was included as part of the banquet, unfortunately it wasn’t great. The Loukoumades (Greek donuts) were nothing special. While they were covered in honey and seasoned with cinnamon, they were undercooked on the inside and soft on the outside. Even the bill pockets are themed. As you can probably tell, there is quite a lot of food in this set menu and the food arrives over the span of a few hours, so this is definitely not an eat and run kind of place. It’s more a social experience for a group of people and those who enjoy traditional Greek music and the ambience it creates. 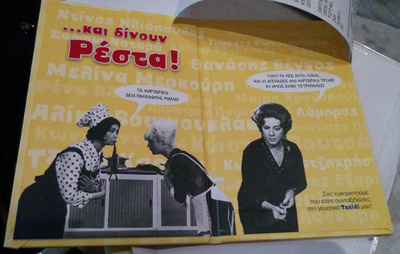 The main theme, past greats of Greek film, is novel and extremely fun. The restaurant venerates Greek cinema and it's stars, and charms guests along the way. If you anticipate lots of awkward conversation with your dinner guests then go here, you’ll never get stuck. Cost: $50.00 for the set menu (Friday and Saturday only). When: Closed Monday and Tuesday. Wednesday, Thursday and Sunday from 6pm - 10pm. Friday and Saturday from 6pm - 1am.